That’s the big question that anyone who knows Bobby is asking. It came as a passing joke, but now the 40 year old moustache is waiting on death row as friends, family and admirers donate to the shave. FoxNet paired with Durrell Communications and Morty’s Pub to present “Shave Bobby’s Mo”. The goal is to raise $5000 for KidsAbility and Nutrition for Learning. Bobby has generously, if not reluctantly, offered to shave his moustache for the cause. 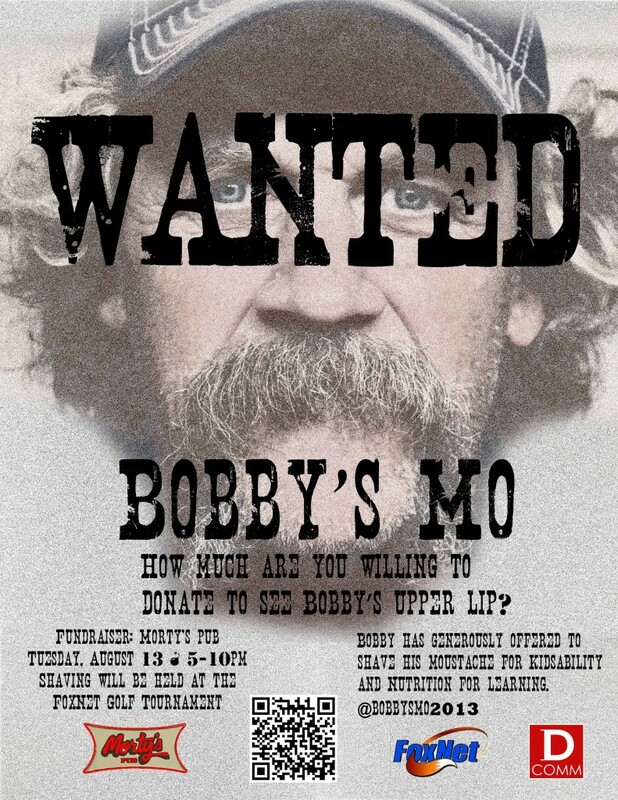 To amp everyone up before the big shave, there will be a “Shave Bobby’s Mo” event at Morty’s Pub Tuesday, August 13th 5-10pm (That’s tomorrow!). Bring your donations to see Bobby’s Stache for the last time because 10% of all sales that night will go to Nutrition for Learning. Donations are welcome and encouraged in advance. You can even choose your charity here. Say goodbye to afternoon snacks leftover from your lunch in your stache, Bobby! The shaving ceremony will be on August 22nd at the FoxNet Golf Tournament. Look for some great shots of the shave on our Facebook page following the tournament. Thanks Bobby – and good luck!